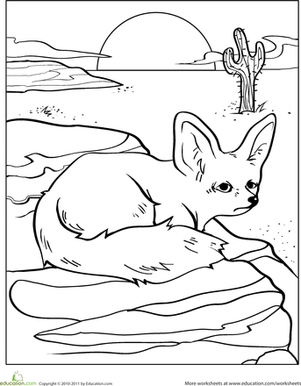 Find all of the desert animals in the worksheet. Can you name these animals? When you're finished, colour in the desert landscape and the animals and use scissors and tape to turn this worksheet into a placemat! For more placemat activities, click Here. Add some colour then turn this worksheet into an aquatic placemat. Then turn the worksheet into a placemat that will not be mistaken for anyone's but yours! Turn it into a delicious placemat when you're done! Then turn the picture into a unique placemat. Colour the picture of the fire truck and the Dalmatian then use scissors and tape to turn the worksheet into a placemat. Create your very own masterpiece on the blank canvas provided then use scissors and tape to turn it into a one of a kind placemat. This desert fox looks like he's lost in the middle of the desert. Can your child cheer him up by brightening the scene with some fun colors? 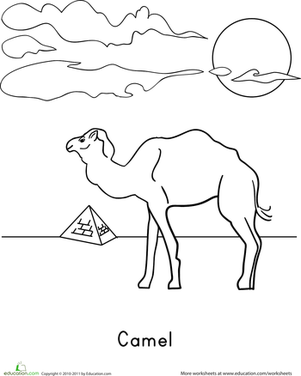 Take a trip to Egypt with this coloring page, which features a camel wandering through the desert.